Stan Lee's World of Heroes is a YouTube-funded channel on YouTube. 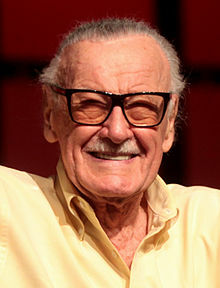 The channel was created by Stan Lee. The first video posted onto World of Heroes, on April 17, 2012, is an episode of a program on the channel, Fan Wars. Other programs on the channel include Stan Lee's Super Model, Head Cases, Bad Days, Stan Lee's Academy of Heroes, Stan's Rants, UnCONventional, Geek D.I.Y., and Cocktails w/ Stan. Vuguru and POW! Entertainment, who pitched the idea of the channel and collaborated to create the channel, unveiled the channel at the San Diego Comic-Con in 2012. The show, Stan's Rants, is based on Lee's old Soapbox column. Felicia Day has appeared in an episode of Cocktails w/ Stan. In 2012, Lee discussed World of Heroes in a Q&A session at the New York Comic Con. ^ Jefferson Graham (July 15, 2012). "Talking Your Tech: Stan Lee launches YouTube channel". USA Today. Retrieved August 9, 2012. ^ a b Patrick Kevin Day (July 9, 2012). "Stan Lee's World of Heroes unveils full lineup". LA Times. Retrieved August 9, 2012. ^ Robert Greenberger (July 11, 2012). "Enter Stan Lee's World of Heroes". ComicMix. Retrieved August 9, 2012. ^ Rob Manuel (July 14, 2012). "Stan Lee Talks About Stan Lee's World Of Heroes At Comic-Con 2012". G4TV. Retrieved August 9, 2012. ^ Sam Proof (September 4, 2012). "Funny Pages – Stan Lee World of Heroes". Crave Online. Retrieved September 9, 2012. ^ Lisa Eadicicco (October 14, 2012). "Comic Con NY 2012 Panels: Stan Lee Talks About 'World of Heroes' Channel In Q&A With Fans". International Business Times. Retrieved October 23, 2012. This page was last edited on 14 November 2018, at 11:04 (UTC).